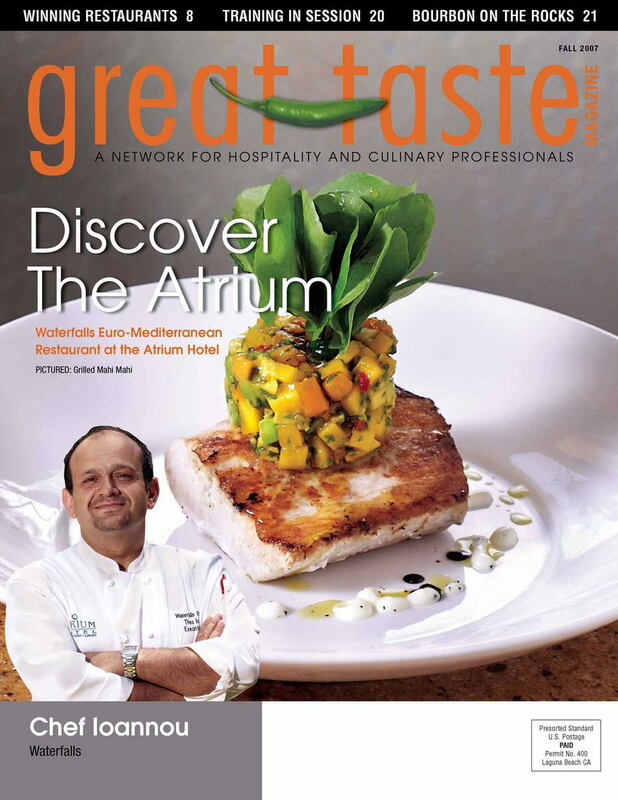 Great Taste Magazine 2007 Fall Issue features Chef Theo Ioannou and the professionals with resources, recipes, beautiful photos and many tasty tidbits. In this issue, discover the Atruim, Orange County’s hidden hotel. Directly across from John Wayne airport, this modern boutique hotel with world-class food and beverage also features a decadent pool scene. Dive on in! Our featured book in this issue is called Kissing in the Kitchen, by Kevin Roberts, and is a fun guide to cooking and dating! Some recipes include the Hook-Up Hamburger, and Pajama Yammies. Trends in this issue feature Newcomer’s Smart Moves. Marche Modern was a stunning success from the moment it opened, and their smart move was featuring a daily three-course lunch option priced only at $20. Read on to learn of other smart moves by Sapphire in Laguna Beach. Who doesn’t love Mahi Mahi? Our Sur Le Menu this issue features twenty-four different takes on this fish dish that you don’t have to travel to Hawaii just to enjoy. Mahi Mahi is very versatile and can be baked, grilled, fried, poached, sauteed or broiled. Try it out at home! Featured on the cover of this issue is Chef Ioannou. Read up on his daring thirteen-month culinary travel adventure that began in Copenhagen, Denmark! 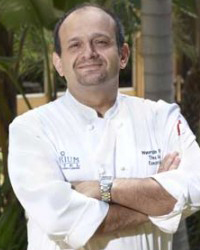 Chef Ioannou to date has visited more than thirty countries and worked in various restaurants in eleven different countries of the world. His journey is definitely an inspiring read. We’re all about going green these days. Read on under Greenbacks for Going Green to see what Gerry Furth-Sides thinks about the whole process. Today, providing the best decor, menu concept and wine programs just isn’t simply enough. How do you encourage the passion it takes to deliver truly exceptional service? We share five tips with our readers for inspired service. Last but not least enjoy some bourbon. We provide you with a couple easy yet satisfying drink recipes that are bourbon based. Enjoy! Great Taste Magazine 2007 Fall Issue covers the restaurants and the professionals with resources, recipes, beautiful photos and many tasty tidbits. Great Taste Magazine, the premiere connection to all the key decision makers in our local Southern California restaurant industry. Each month our 15 year-old full-color trade publication reaches thousands of the area’s top restaurant owners, general managers, executive chefs and buyers. Take a tour through the magazine. Each issue features a restaurant and local chef, and is packed with the timeliest information, critical operational tips and other industry news important to our readers.